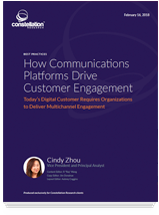 How Communications Platforms Drive Customer Engagement | 8x8, Inc.
Today’s digitally empowered customers create a challenge for organizations to sell, market and service them effectively. Expectations are higher than ever before, and customers openly share both positive and negative experiences with just a few clicks on review websites, app ratings and social media. Organizations still using traditional communications methods are losing the customer experience battle and need to modernize how they engage with customers who are demanding more ways to interact with brands.